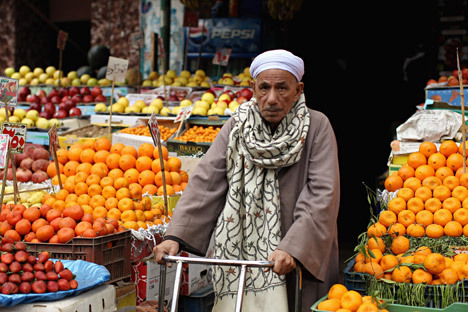 Egypt may replace Turkish fruit and vegetables to Russia. Egypt and several other countries are prepared to step into the gap left by Turkey as the supplier of fruit and vegetables to Russia, following the ban on Turkish food imports that will come into force on Jan. 1, 2016, Russian Industry and Trade Minister Denis Manturov has said. The ban on Turkish produce covers tomatoes, cucumbers, cauliflower, broccoli, onions, grapes, oranges, tangerines, apples, pears, apricots, peaches and nectarines, plums, wild strawberries and strawberries, as well as frozen poultry carcasses and offal, fresh cloves and salt. What does Egypt have to offer? "Turkish food imports are being actively substituted and this process has two driving forces. It is not just that our retailers are seeking to fill the gap with purchases from new suppliers but representatives of other countries have offered to occupy the niche that has appeared on the Russian market," explained Dmitry Bulatov, president of the National Union of Food Exporters, who said the most initiative is being shown by Egypt. "They are now analyzing the list of products that they could supply to Russia, including tomatoes, which previously Egypt did not export to Russia in large quantities. We mainly buy tomatoes and citrus fruit in China and Morocco, and grapes in Chile, Peru, India, Iran and Egypt. These countries have offered to increase their supplies too," said Bulatov. "In general, we purchase tomatoes, grapes and citrus fruits from dozens of countries, only in smaller quantities, and these countries are certain to catch up and seek to increase their supplies to the Russian market," he said. What does Syria have to offer? Syria has also announced that it is ready to supply 700,000 tons of citrus fruit, mainly oranges, to Russia as part of the drive to substitute Turkish imports. According to the head of the Syrian Chamber of Industry, Faris Shalabi, the first batch has already been dispatched to Russia. Furthermore, Syria also intends to export textiles and other goods to Russia. "The sanctions against Turkey create a considerable niche on the market and unexpectedly open real opportunities for Syrian products," said the head of the Damascus Chamber of Industry, Samir Dibis. A delegation of Syrian businessmen will visit Russia shortly. The main problem, however, is transportation. Given the unstable situation in Syria, it is difficult to predict whether the Syrians will be able to ensure uninterrupted supplies. At the same time, it is hard to say whether Russia will manage to find alternative suppliers to fully substitute all Turkish imports in the three weeks left before the embargo comes into force, since it will take time to hold negotiations and sign contracts with various suppliers for each type of product. Russia already has extensive experience in substituting European food imports, following the embargo it imposed on EU produce in summer 2014 in response to Western sanctions against Moscow over its role in the Ukraine crisis. However, back then there was more time. The situation was more complicated too: Russia had to find completely new suppliers, whereas now, in effect, it just needs to increase imports from the existing ones along the established routes, meaning the substitution of Turkish food imports should be arranged much faster. First published in Russian in Vzglyad.